Larson dominated Auto Club from the pole, leading 110 laps on his way to his second career Monster Energy Cup Series win in 2017. Note: Below is a Fantasy NASCAR Auto Club Speedway preview article from Wheels (@DK_Wheels) and PJ (@PJFrapDFS) of the Power Hour DFS (@PowerHourDFS) crew. Race number five in the Monster Energy Cup Series bring us to Auto Club Speedway in sunny California. Auto Club Speedway is a D-shaped 2-mile oval that held its first NASCAR race in 1997. I bring up the year because that was the first and last time that this track has been paved. Similar to Atlanta this track will eat up tires all day long. A big difference in the two tracks however, is the long sweeping corners at Auto Club compared to the tighter corners at Atlanta so fall off isn't as drastic but it is still going to play a major role here. Restarts at Auto Club Speedway are INSANE as they provide the best opportunity to pass and with the fall off being so drastic that you have to get the spots you can on these restarts. You are going to see three and even four- wide racing going into turns 1 and 2 on these restarts, especially if we get a late race caution like we saw here last year. If that does pan out again, plan on the initial caution breeding more cautions, because these restarts are so crazy - we saw four yellow flags last year in the last 15 laps! You are going to want to look at drivers who perform well on restarts and obviously on the 2-mile ovals that aren't Super Speedways. Last year we saw a lot of inspection issues at Auto Club with big names not making it through qualifying inspection and starting at the rear of the field. Of those big names, it was highlighted with Joey Logano (P35) and Jimmie Johnson (P37). Kyle Larson - Larson took NASCAR by surprise out of the gate last year and ultimately dominated Auto Club from the pole, leading 110 laps on his way to his second career Monster Energy Cup Series win. Not only did Larson win the 2-mile Auto Club, but he went on to sweep the 2-mile sister track as well (Michigan), giving him the 2-mile season clean sweep. 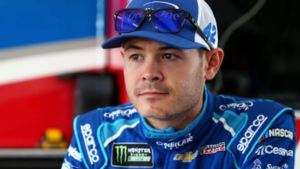 It is hard not to consider Larson as one of the favorites this weekend, given his 2017 success. Kevin Harvick - At this point, Harvick is only on pace for 27 wins! A remarkable three consecutive wins in a row and now we head to the oldest track surface on the circuit… sure feels like four-for-four is in the cards. While Harvick only has one win, it should come as no surprise that he is the odds-on favorite to win this weekend. Jimmie Johnson - On paper, this is a smash spot for Jimmie as he has won here at Auto Club 6 times and recorded 13 top 5's in 23 tries. But outside of Johnson's win in 2016, he has only recorded one top five (the win) once in the last six tries. OK, what about recent form? Well, Johnson hasn't scored a top five since Indy last year, 20 races ago… yes, 20! Jimmie feels like a Place Differential play only this weekend, but even that may be hard to stomach. As always, will hold all final leans until after we see how the starting grid is set and how the practices shake out. Kyle lead 110 of 202 laps here last year and has been dominant on these types of tracks. Michigan is the sister track to Auto Club and Larson has won three of the last four races there. Only four races here and he had issues in two of them but the other two finishes are first and second. Not sure how you don't put him in here at this point. Struggled a bit last year but they are light years ahead of that this year. Lead 142 of 205 laps here in 2016. I don't even think you need many stats right now, they have found something and it's evident. Trying to win sweep the west coast in his home state. He is running the K&N West race at Kern County Speedway on Friday which doesn't really do much for this race other than to tell you that he is very relaxed and confident. Since Harvick is too easy to pick, I'll give you my thoughts on the next two in line. The most 100-point AutoClub scoring efforts (three times). Recent form is solid with back to back runner up finishes behind Harvick. Was able to jump out early at Phoenix and lead a chunk of laps before his wheel hop issues caught up with him. The wheel hop issues are fresh on the minds of people that played him, so may lower his ownership some if everyone flocks to Harvick and Kyle Busch. Earlier in Jamie's career he was ELITE here scoring five top 10's in the first six races he ran here. In 22 career races here, Jamie has 15 top 20's. Bowyer is just too cheap for me this week. Stewart-Haas has clearly hit on something this year and this is Clint's fourth best track statistically. In 17 career races here, Clint has 15 top 20's to go with 8 top 10's. His numbers would be WAY better if he had good equipment each time. If you take away his time with Michael Waltrip and HScott Motorsports, his average finish here would be 10th. Yes please. 34.3 DK average all-time in lesser equipment. Posted 58.0 DK pts last year in his first run in the SHR #14 Ford. Price dropped, even though Bowyer had a solid Phoenix run. All the stats are lining up early on for Bowyer to be an excellent value play this weekend. But last year in Xfinity, Byron recorded a T5 at Auto Club and a T5 at Michigan. In 2016 (Trucks) recorded a T5 at Michigan. Led some laps, playing the track position game at Phoenix and turned in a solid P12 which at this price is more than you can ask for. Right on the $6K punt number and that number is WAY too low for Allmendinger. Seven of the last eight races AJ has finished inside the top 20, with two of those being top 10's! Has a positive place differential in eight out his last nine races here. I can't believe he is this cheap. All-time AutoClub running position average of 22.5. Six spots higher than the next closest punt.